The Silver American Eagle is one of the finest coins in the world. First struck in January of 1986, the coin is the official silver bullion coin of the United States. The imagery used on the reverse and obverse of each coin evokes feelings of patriotism and American pride. 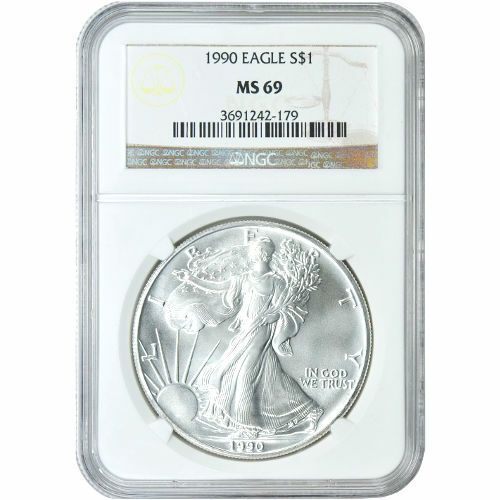 Available for purchase now from Silver.com are 1990 1 oz Silver American Eagle coins with MS69 grades from the Numismatic Guaranty Corporation. Silver American Eagle coins were authorized by Congress with passage of the Liberty Coin Act of 1985. The program uses silver stores from the Defense National Stockpile to strike a national silver bullion coin. All of the silver used in these coins is sourced from within the US. Adolph A. Weinman’s Walking Liberty image was reintroduced on the obverse side of Silver American Eagle, while the US Mint’s Chief Engraver, John Mercanti, developed the heraldic eagle image on the reverse. Each coin available in this lot has a Mint State 69 grade from the NGC. This grade is one of the most common passed out by the certification service for the Silver Eagle, but coins with this grade remain difficult to find at times. An MS69 grade indicates a coin with a sharp, attractive strike on the mint mark and year of minting, with no more than two blemishes on the coin’s surface. The obverse side of the coin bears Weinman’s Walking Liberty. The image of Lady Liberty striding toward the setting sun was first developed in 1916, and used on the Walking Liberty Half Dollar until 1947. On the reverse side is Mercanti’s image of the heraldic eagle. Unique features include a set of 13 stars above the eagle’s head, representing the original American Colonies. The United States Mint was founded in 1792 following passage of the Coinage Act by Congress. The Mint’s establishment is predated by only one other mint in North America, the Mexico City Mint. It has a long history of excellent designs and its coins have been recognized by collectors throughout the world for centuries. 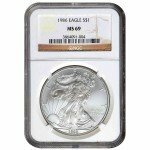 If you have any questions about this graded 1990 1 oz Silver American Eagle Coin, Silver.com staff are eager to help. You can connect with us on the phone at 888-989-7223, online using our live chat service, or by email.